Bet Victor recently left the iPoker network behind them and made the transition to another popular european poker network, namely Entraction. In doing so they parted ways with their old download and now offer a skin of the Entraction client. There isn’t a huge amount of difference between the old and new software, but if there was something small and specific that turned you away from Bet Victor in the past then it might be worth checking out their new download, which weighs in at 4.4MB. Sadly the biggest flaw in Bet Victor remains after the transition to the new network, namely that players from inside the United States are unable to create accounts or play at the site. Players from the rest of the world should have no trouble getting in on the action, however, as while the Bet Victor downloadable client is only for Windows, they also offer an in-browser instant play interface which will run in pretty much any browser on any operating system. They also offer a wide variety of languages, making it unlikely that you’ll be forced to play poker in a language that isn’t your first. 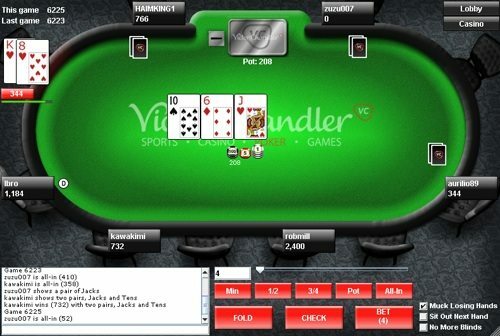 While, strictly speaking, not all poker room lobbies were created equal, these days most poker sites have polished their interface enough such that you’ll feel pretty much at home with the Bet Victor download even if you’ve never played on an Entraction site before. 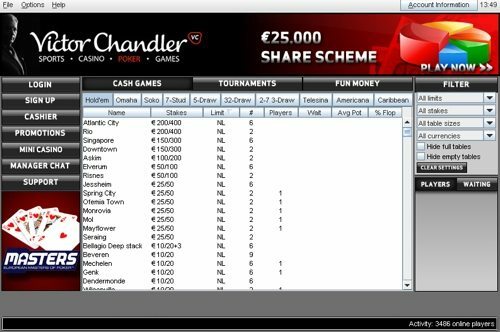 The cashier and support desk are all accessible, and tables are organized by the standard system of filtering tabs which narrow down the type of poker you want to play. All the information you want to see about specific tables is displayed in the list, and on the far right of the lobby is a more advanced filtering system which allows you to make the lobby only display exactly the kind of tables at which you want to be seated. Similarly, the tables at Bet Victor aren’t home to anything vastly different than what is found at other poker rooms. The bet, pot and stack sizes are displayed clearly, and there are nice animations although the cool avatars of some other poker rooms are lacking. Nit picking for a second, the betting interface is a little bit cluttered with “Min Bet”, “1/2”, “3/4”, “Pot” and “All-In” all having their own buttons in addition to the traditional three actions and the bet slider. While it’s not unusual for fractions of the pot to be part of the interface, Bet Victor has given them quite large buttons, and there is potential for mistakes if a lot of tables are being played. To sum up, the Bet Victor downloadable client is nothing revolutionary, but the industry has been around for so many years now that the standard product is actually very good and polished to a high degree. That is, while you’re not going to find anything that blows your mind here, it’s unlikely you’ll find such a thing anywhere else, and you’re certainly not going to find anything to complain desperately about either, making Bet Victor a perfectly acceptable choice.